A few years ago, I started to document God's killings at my blog, Dwindling in Unbelief. I began with Genesis and worked my way through the Bible, writing a post for each killing event and keeping a running count of the number of victims as I went along. I don't think it's ever been done before,1 which is a shame, since God is so proud of his killings. You don't believe me? Well, here, I'll let him tell you directly. Bible believers, on the other hand, are less proud of God's killings. Oh, they like a few of them -- Noah's flood, David and Goliath, Jericho -- those that can be made (with considerable dishonesty) into cute children's stories. But the rest are completely ignored by, or completely unknown to, believers. I believe that most believers would stop believing in the Bible if they knew what was in it. And this is particularly true of God's killings. All of the stories are absurd from a historical standpoint; they could not have happened the way they are told in the Bible. But what is even more damning is their unspeakable cruelty and obvious immorality. If the killings described in this book actually happened, then the God of the Bible is not the kind of God that believers pretend him to be. In this book, I've tried to count all of God's killings: those that are numbered in the Bible and those that are not; the ones that God did himself; those that he instructed others to do; and those that, while he may not have taken an active role in, met with his approval. Of course, some killings are easier to count than others. When God burned to death 250 men for burning incense in Numbers 16:35, we know how many were killed. But how many did God drown in the flood or burn to death in Sodom and Gomorrah? How many first-born Egyptian children did he kill? There's just no way to know for sure. So I have two tallies: one for the killings in which numbers are given in the Bible, excluding the others; and another that uses both the Biblical numbers and estimates when numbers are absent. But what about the killings that God apparently approved of, but didn't take an active role in? Take the story in 1 Samuel 18:25-28, for example, in which David buys his first wife with 200 Philistine foreskins. Did God approve of that killing? Well, yes he did, if you believe the Bible, that is. God approved of everything David did, including all of his killings, with only one exception: the killing of Uriah. How do we know this? Because it says so in the Bible. 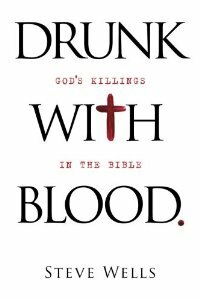 Drunk with Blood includes a separate account for each of God's 158 killings. They are presented in the order that they occur in the Bible, along with the number killed, either the Bible's number or an estimate, or both. In each account, I've made an effort to quote enough of the actual story from the Bible to make it unnecessary to refer to the Bible itself. Still, I encourage everyone to read these stories in the Bible. It is nearly impossible to believe in the Bible once you have read them. How many did God kill? Here's the total, if you use only numbers that are provided in the Bible: 2,821,364. I can only find ten, and even these he shares with God, since God allowed him to do it as a part of a bet. I'm talking about the seven sons and three daughters of Job. When the Bible doesn't say how many were killed, I try to provide a reasonable estimate. For example, the Bible says that Job's ten children were killed in God and Satan's bet. The Bible also says that all of Job's servants (slaves?) were killed, though it doesn't say how many. But since he was a wealthy man ("the greatest of all the men of the east"), he probably had many servants. So I guessed that fifty servants were killed, and I gave both Job and God credit for their killings. I made similar estimates for the other killings when a number was not provided in the Bible. I tried to give an idea of my thinking for each estimate at the end of each killing account. When there was no clear way to get a number from the Bible itself, I used estimates from Colin McEvedy and Richard Jones' Atlas of World Population History (Middlesex, England: Penguin, 1978). The "Apocrypha"(or "Deuterocanonical Books")2 are considered sacred scripture by more than a billion Christians, members of the Catholic, Orthodox, and Coptic churches. Another billion or so (the Protestants) consider them non-canonical and exclude them from the Bible. It's one of the many things that divides the followers of Jesus, contrary to Jesus's prayer in John 17:21. 1) Nothing fails like prayer (even when Jesus does the praying), and 2) God didn't send Jesus. But whatever the canonical status of these books might be (I'll let the Christian's fight that out), there are many impressive killings in them -- killings that were inspired, commanded, or performed by God, and therefore deserve to be included in this book. You might think the title of the book is a bit unfair. A single verse that uses the phrase "drunk with blood" is hardly enough to go on, especially if context is taken into account. But the phrase (or variants of it) is used five times in the Bible, and context (as usual) doesn't help at all. And finally, the great whore of Babylon will be drunk with the blood of the saints and martyrs. But enough with the blood, guts, and gore. Let's get on to the killings! Other attempts to list God's killings have recently become available. For and excellent summary of God's killings in the Bible see Steven Pinker, The Better Angels of our Nature (New York: W.W.Norton & Company, 2011), 6-12. And see Matthew White, The Great Big Book of Horrible Things (New York: W.W.Norton & Company, 2001) for a list of religious killngs in the Bible (109-110) and bilical genocides (192). Quotations from the Apocrypha/Deuterocanonical books are taken from the Douay-Rheims Version, since that translation is in the public domain and is the traditional Roman Catholic translation. I know that God doesn't mean this literally. God's arrows don't have mouths; they don't drink blood and they've never been drunk on anything. His sword doesn't eat flesh either. God is being metaphorical here. Still, God is trying to make a point. He's saying that he kills people. Lots and lots of people. And that is what this book is about. God's sword is not only drunk with blood; it's filled with blood and is bathed in blood in heaven. God is as strong as a unicorn. (Heck, I bet he's even stronger than a unicorn.) And he has quite an appetite, too. He will eat entire nations, and break bones and pierce bodies with his arrows. God is angry with people every day. His sword is sharp and his bow is bent. He has prepared all the instruments of death. I'm not sure how much of this is metaphor. God often talks about forcing people to eat other people. That part, at least, is literal. Here are a few examples. So while it is true that part of God's plan for humanity is forcing people to eat each other, he was probably just getting carried away with his own metaphor when he said they'd get drunk on their own blood. Oh, one more thing that believers should know. God wants them to keep their swords bloody, too. He'll curse (and probably kill) anyone whose sword isn't dripping with blood. God talks a lot about feeding dead people to birds and animals. Here are some examples. Believers will get into the act, too. Heck, they even get to drink the blood of God's victims after they wash their feet in it. And, of course, all believers must drink the blood of Jesus if they want to get to heaven.